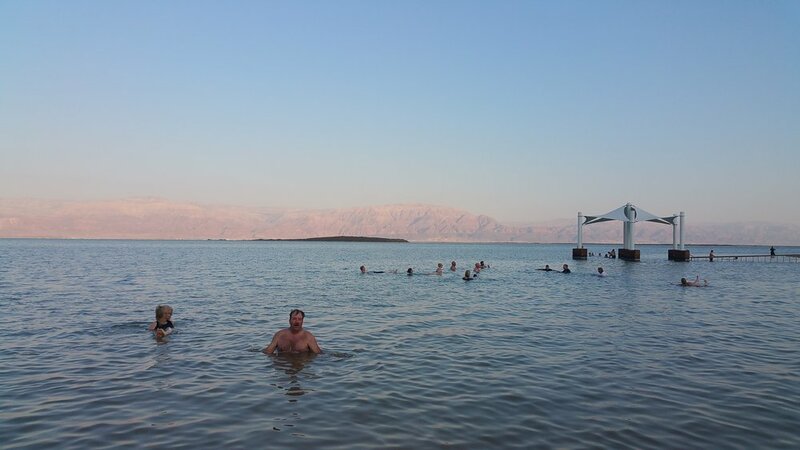 Here are the blog posts from my study trip to Israel this year. Feel free to share it and use it as you like. Great memories! PS--If you find any errors, please let me know. I make plenty of mistakes! Day 13/14--What a Great Family! Anticipating the Best Reunion Ever! Please indulge me with this longer-than-usual post. Thanks. Today we journey from Jerusalem to Bethlehem, a mere 6 miles away yet a different world in so many ways. Bethlehem is the most Christian populated city currently in Israel. Understand that when someone here says they are Christian and follow Jesus, it may mean nothing more than "I am not Muslim or Jewish." That said, for those Arab Christians who comprise the majority of Bethlehem they are faced with discrimination and difficulty because Bethlehem sits within the central West Bank and under the Palestinian Authority. Within the West Bank exist levels of security, and our tour guide Jacob is not allowed in a high security area like Bethlehem. So, we welcomed a delightful Arab Christian from Palestine named Johnny. We spent time overlooking shepherds' fields and reflecting with Paul Gostanian on the history of this area near Bethlehem which means "the house of bread." Many years ago these were the fields of Ruth and Boaz (Ruth 1-4). In her story Ruth and Boaz have a son Obed who has a son Jesse who has a son David who would be king. So Bethlehem is called the city of David. We were reminded that Ruth was a Moabite (a despised people). Faith made her part of the genealogy of Jesus. Like her, for us faith is to live as Jesus lives. Our guide Johnny offered this perspective: "Many here don't know Jesus. God brought the good news through the lowest people on earth because they believed the word of God. The Lamb for the temple; Jesus, the Lamb of God, for us. Pray for Christians to return to Bethlehem. There is no work here because of prejudice, so they move away for work." We then went then into the chapel and sang carols surrounded in wonderful acoustics. Next we visited a Nativity store run by Arab Christians. They presented Kurt with a silver chalice featuring beautiful craftsmanship. To check out their wares, go to https://www.facebook.com/Bethlehem-Nativity-Store-619699504747180/. We moved on next to the Church of the Nativity in Bethlehem. This ancient church was first built by emperor Constantine's mother Helena. In my opinion it is quite ornate, perhaps gaudy. The church is shared by leadership from the Greek Orthodox, Roman Catholic and Armenians. 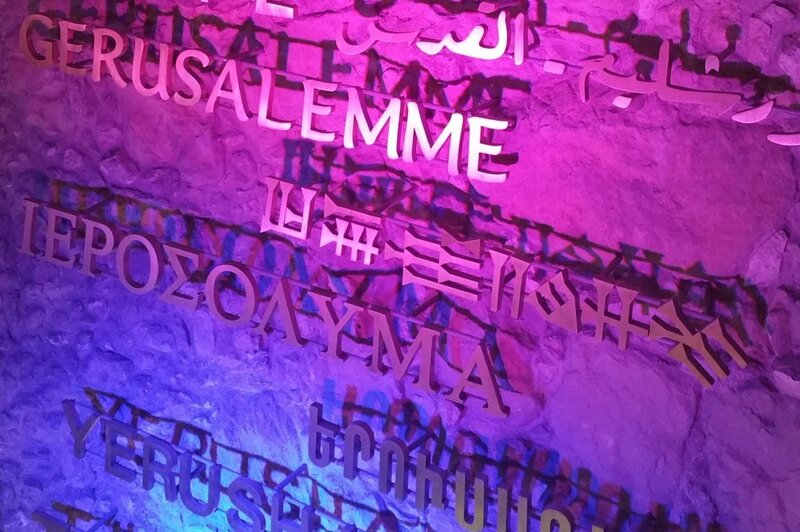 To learn more, go to http://www.sacred-destinations.com/israel/bethlehem-church-of-the-nativity. 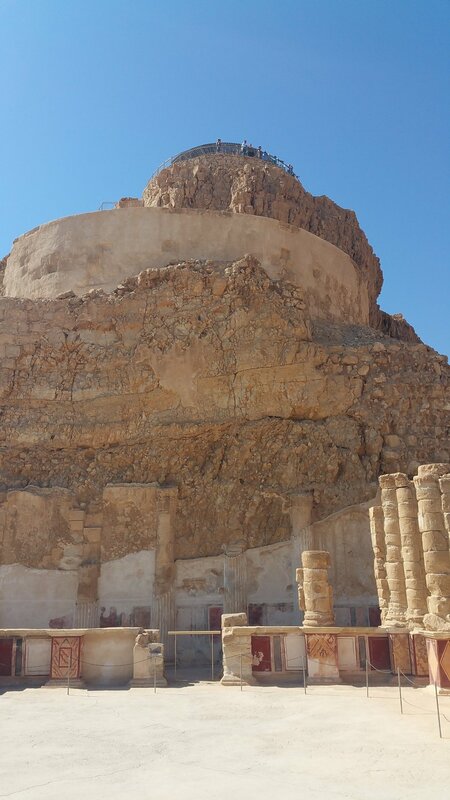 We also paid a visit to The Herodium Palace, the ruler's palace which he favored. Earlier in history the area was significant because of a supernatural intervention by the living God (see 2 Chronicles 20:1-20). God is a God who keeps his promises, who protects his people. To learn more, go to http://www.mfa.gov.il/mfa/israelexperience/history/pages/herodium%20-%20king%20herod-s%20palace-fortress.aspx. 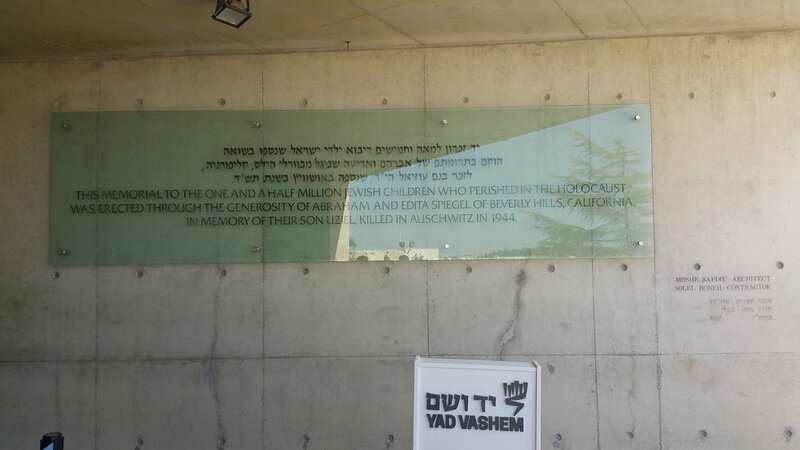 Our final stop of the day was to the Holocaust museum, Yad VaShem, in Bethlehem. To prepare ourselves we read Isaiah 56:5 and considered the significance of God's view of us: we are faces, not numbers. This museum seeks to tell the stories of countless men, women and children who suffered the Nazi regime. Wow. What a moving experience. As I was immersed into the history of evil and tragedy at the hands of the Nazis and it's collaborators, I cannot hold back tears for human beings who have, are, or will suffer undeserved assault. But the horrors of the Holocaust must not be divorced from the millennia of human carnage, all which reveal one simple truth: that same seed of evil exists within each of us and reminds us that, were it not for the merciful intervention by our holy Creator, we would all--myself included--devolve into the base, natural, self-serving thoughts and behaviors that simply echo the murderers, torturers, and despots across the ages. Today I worship my God in the faces of these innocents and pray, "Come, Lord Jesus" (Revelation 22:20 NIV). 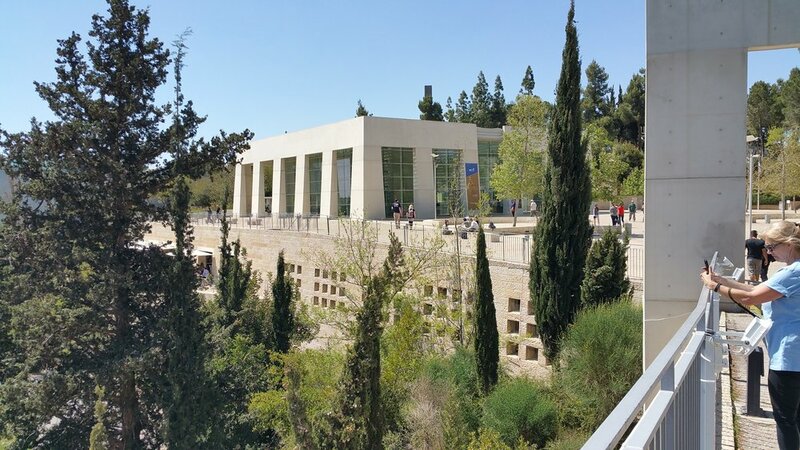 To learn more, go to http://www.yadvashem.org/. God is more awesome than I ever imagined yet He desires intimacy with me as His child. As the trip nears its conclusion, please allow me to be very transparent about my emotions. Today at the holocaust museum I was overwhelmed by the horror. I've seen it before, but today my emotions were very present. Men are often described as unemotional. I respectfully disagree. In fact, men simply withhold the expression of emotion. And unfortunately when it is acknowledged it is sometimes volcanic and disruptive. At this season in my life I find that I must learn to acknowledge my emotions to myself and others. For those of you who know me well, you know that I am deeply shy, that I often feel inadequate for words in the moment, that I simply don't have words to express the deep feelings I carry. This is one of the reasons that I have gravitated to writing as an expression of thought. It's good for me. With all the change I have experienced in my world over the past year, participating in this trip to Israel held promise. I had several very personal goals: 1) lead our group well in the diligent preparation for the trip; 2) do all I can to encourage others; 3) rediscover my joy; and 4) learn again how to be intimate with my heavenly Father and with those I love. As the trip draws to a close, I find myself at peace and amazed at the ways He has met me in these desires. We have been running at a frantic pace, yet hidden in the journey is the presence of our Lord. He is with us as we read His Word together, and gaze upon a mind-stretching archaeology site, and enjoy the varied brushstrokes of our Creator's work, and learn to care for another as an expression of the sweet Savior we share together. These are precious moments for those who are privileged to share in an adventure like this. We will never be the same. And we may never see each other again this side of heaven. Yet, even though we begin as acquaintances and strangers, we leave this place brothers and sisters and friends for life. The memories we share. The distance we tolerate. Geography is not king; Jesus is our King. So, if you have not been privileged to deepen your discipleship by exploring your spiritual roots like this, I urge you to start saving now. Come, Lord Jesus. "I thank my God every time I remember you. In all my prayers for all of you, I always pray with joy because of your partnership in the gospel from the first day until now, being confident in this, that he who began a good work in you will carry it on to completion until the day of Christ Jesus. And this is my prayer: that your love may abound more and more in knowledge and depth of insight, so that you may be able to discern what is best and may be pure and blameless until the day of Christ, filled with the fruit of righteousness that comes through Jesus Christ--to the glory and praise of God." Today was a shorter day in order to make time for an afternoon of shopping. We began on the Temple Mount, dressed appropriately. This is the location of the temple Jesus knew, later destroyed by Titus in AD 70, but it is now home to the Dome of the Rock, the Muslim building to honor the thought of Muhammad's ascension from here. 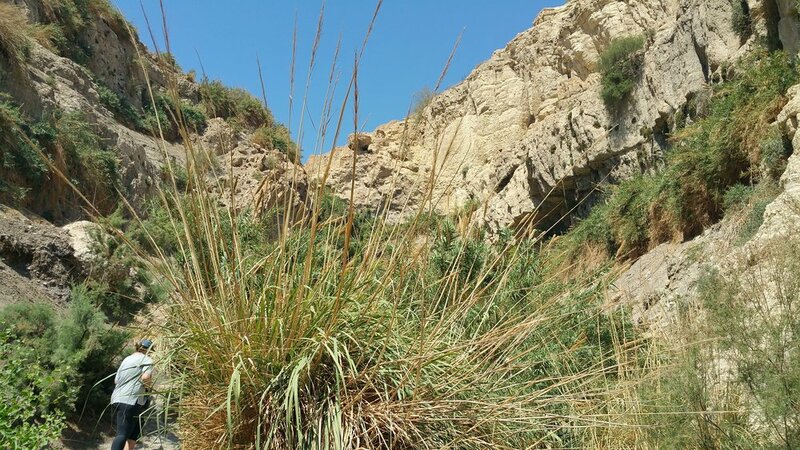 Known in scripture as Mount Moriah, this hill is where Abraham was instructed to sacrifice his son Isaac in a test of his obedience to God (Genesis 22). Unfortunately the Muslim world has an alternate reality where it was Ishmael, not Isaac, who was offered in sacrifice here. In a city and region of tension, both sides make compromises for peace. Regarding the Temple Mount, that compromise was that Israel gave up control to the Muslims. Since it is Muslim-controlled, we had to be careful about what we wore, that we brought no Bibles, that there be no show of affection or joy, and that there is no praying. Well, some of us got called out for showing affection or joy, but there is no way they knew we were praying! The Jewish temple is important to us as Christians because it illustrates the centrality of God to our relationship with Him as individuals and a whole nation. In the temple God revealed His glory and made access to Him possible through a priest. But our bodies are His temple now, Christ in us the hope of glory. We no longer need sacrifices to atone for sin or priests to serve as our access because Jesus came to die as our substitute and to become a permanent High Priest interceding always on our behalf. In the temple we find the value of the past, the joy of the present, the hope of the future. To learn more, go to http://templemount.org/. Interesting note: Jerusalem has been rebuilt 17 times. We then explored what is known as the Citadel and Tower of David museum near the Jaffa Gate. In reality, this structure is likely the site where Jesus was interrogated by Herod during the trials Jesus endured. To learn more, go to https://www.tod.org.il/en/. After the museum we walked on the ramparts around the Zion gate and then went to lunch. After lunch... free time for shopping. So imagine 36 Americans heading out to shop the merchants in Jerusalem. It was fun and unfamiliar at the same time. These male shopkeepers have learned the trade through many generations, and they are masters of the sale. Everyone I asked seemed to enjoy the experience and came away with something satisfying. Of course, that many shoppers is also good for the merchants who depend on the purchasing power of tourism. Many, many sellers are on a first-name basis with Ken, and we are so glad! To learn more, go to http://www.epilgrim.org/ramparts_of_jerusalem.htm. Fatigue is temporary; fun is contagious. This is the point in a study trip like this that exposes the fatigue from information overload, bodies operating in a different time zone, poor sleep, inadequate sleep, no sleep, etc. You get the point. Even while we can't wait to go to the next site, there is in fact the reality of fatigue. We can see it in each other's eyes and hear it in our tired voices. For some it shows up with illness or sore muscles or pained backs. Even while fatigue is present there are still awesome moments when the joy of the Lord invades our presence through a funny comment, a thought-provoking devotional idea, spotting a vendor with Magnum ice-cream bars, or just enjoying becoming better acquainted regardless of our home address. After playing in the Dead Sea last evening and enjoying a night in a spa hotel, we began our journey north again making our first stop at the ancient mountain fortress known as Masada. In Hebrew, the word "masada" means fortress, and that is exactly what this piece of real estate became over time. For the Jews, this special place represents the last Jewish stronghold against Roman invasion. The Roman army of 20,000 came against 967 Jewish people (men, women and children). Why did the Romans need to take this? They didn't. But it was about dominance. Kind of like the Alamo. 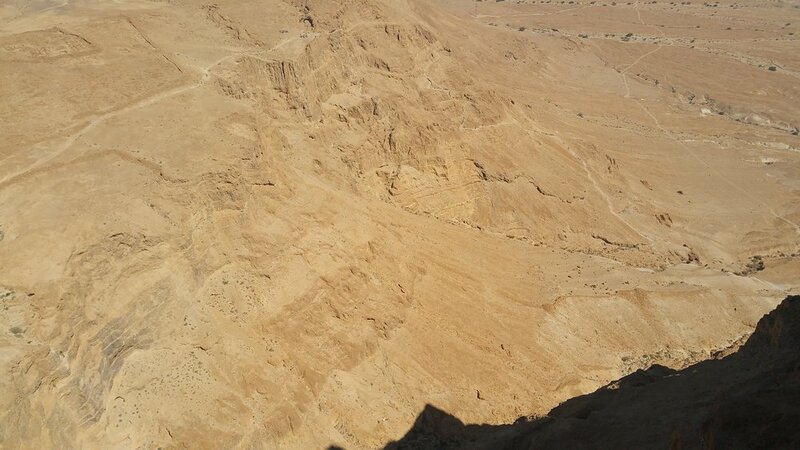 To learn more, go to http://www.jewishvirtuallibrary.org/masada-desert-fortress. After getting to the top, we were all able to hear more about the history and explore the various structures that have endured. Fortunately for us, historian Flavius Josephus was able to pass along the accounts of what occurred here. 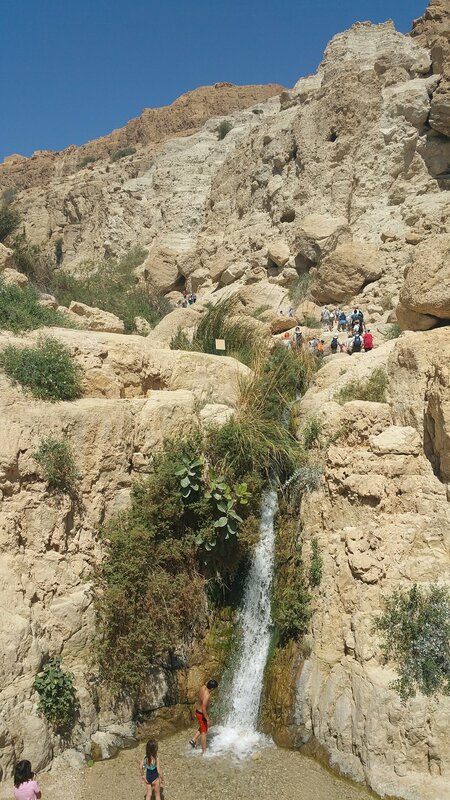 After grabbing a Magnum ice cream bar, we boarded the bus to move further north to the beautiful site of En Gedi. Here was another hike, but it was a wonderful trek back into a waterfall and cove, along welcoming pools and beautiful scenery. Two creatures are frequently seen here: the Ibex and the Hyrex. If you don't know what they are, look it up and marvel. At the first pool we stopped to read Proverbs 30:24-28 and Zechariah 14:1-11 as we connected past and future. 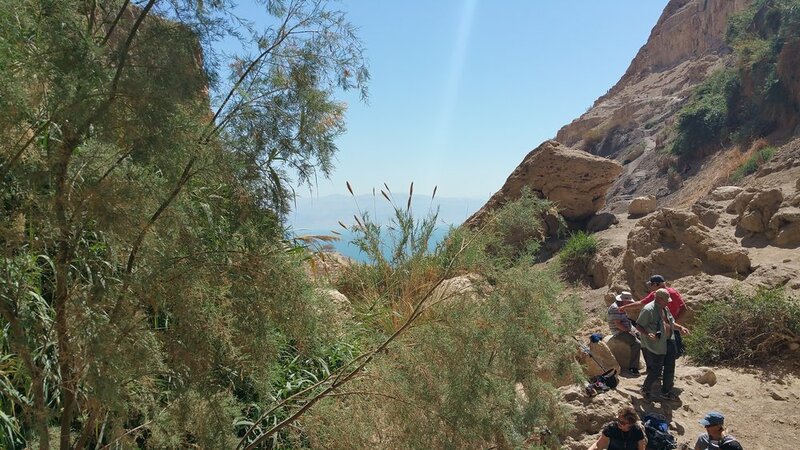 I remarked to several of my tripmates that I could spend a week at En Gedi alone with God. Interestingly, my allergies went crazy here. Go figure! After a shopping stop at the Dead Sea's AHAVA outlet store for skin treatment, we enjoyed lunch and then the site of Qumran. 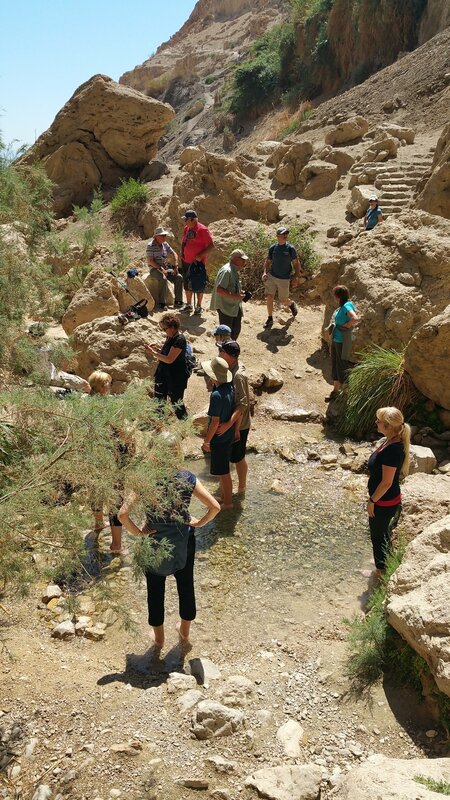 To learn more, go to http://www.biblewalks.com/Sites/EinGedi.html. Qumran is the famous location where the Dead Sea Scrolls were discovered by accident in a cave in the area. The Qumran find has exonerated the veracity of the Old Testament against the liberal thinkers of the day who were skeptical about it up to that point. Isaiah scroll was a phenomenal find. The Essenes, a private religious community living in the desert) hid the scrolls because after the fall of Jerusalem in 70 AD they aimed they were the last Jews alive. We opened our Bibles and read Luke 1:5-20; 3:1-3 about Zechariah and John the Baptist. At Qumran more than 800 caves are still unexplored. Why? One reason is that handling the scrolls is a difficult issue because Qumran is in the West Bank. It is about control. One person reminded us that Muslims begin dating history that matters to them with Muhammed, so they will destroy anything prior to that because to them it is irrelevant. Humility hurts. 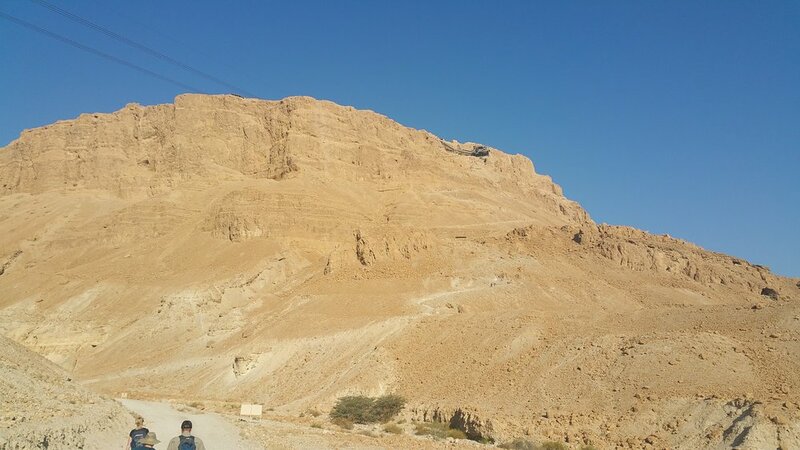 Hiking up the face of Masada needs to be balanced with the pace at which you attempt it. There are two ways to get to the top of this mountain that towers 1424 feet above the Dead Sea: (1) take a 3-minute cable car ride, or (2) walk it. Of the 36 people on the trip, 13 of us determined to make our way up the Snake Path on the eastern side of Masada. All was well for about half the hike until I began noticing my heartrate running too high. So for the remainder of the hike I had to slow my pace, work at deep breathing, and get to the top behind everyone else. It became a grueling hike for me not because of leg fatigue but because of heart rate and nausea. My legs are strong, but my heart rate just got too high so I needed more frequent breaks. The team was gracious to wait for me and cheer me on. Thanks, everyone! Today we move south into the desert. On our way we learn from our guide Jacob his perspective on the educational system in Israel. To sum up, he suggested that the mandatory draft into the military is the best education for life. Many also study abroad to become well connected in the world. The two official languages in Israel are Hebrew and Arabic, not English which has been resisted because of colonialism. While that may be true, many Israelis do quite well with the English language. Ironically, there is a community west of Jerusalem on the road to Emmaus that claims to be the largest Elvis fan club in the world, referred to as "Little Memphis." Sure enough, as we drove by we could see the Elvis sign declaring their fandom. No kidding. If you're interested, http://www.ibiblio.org/elvis/elvisinn.html. Fun Fact: about 10 percent of those living in Israel are from north America. This was a supercharged day with an abundance of driving and significant sites to visit. We visited Tel Beth Shemesh, an excavation of an important Israelite city in the Sorek Valley, a bordering Judah and Dan and given to the Levites. It represents the Middle Bronze Age through the Iron II period. To learn more, go to http://www.biblicalarchaeology.org/daily/ancient-cultures/daily-life-and-practice/bet-shemesh-2000-year-old-jewish-settlement/. Another stop was to the site of Azeka overlooking the Elah Valley where the philistine army opposed the Israelites and taunted them by mocking the God of Israel. In that era it was customary for each army in conflict to send their best representative to do battle on behalf of their side. Whoever would win was the victorious army. 1 Samuel 17 tells us the story of just such a conflict occurring when the Philistine giant Goliath was confronted by the young man David, a person in no way physically capable of doing battle. But it was David's confidence in the Lord that moved him to stand up to this huge bully and, with five smooth stones, he used his slingshot with dead aim and hit Goliath's forehead. The Valley of Elah is formed like a natural amphitheater with ample seating on each side. Amazing to visualize this piece of Israeli history. 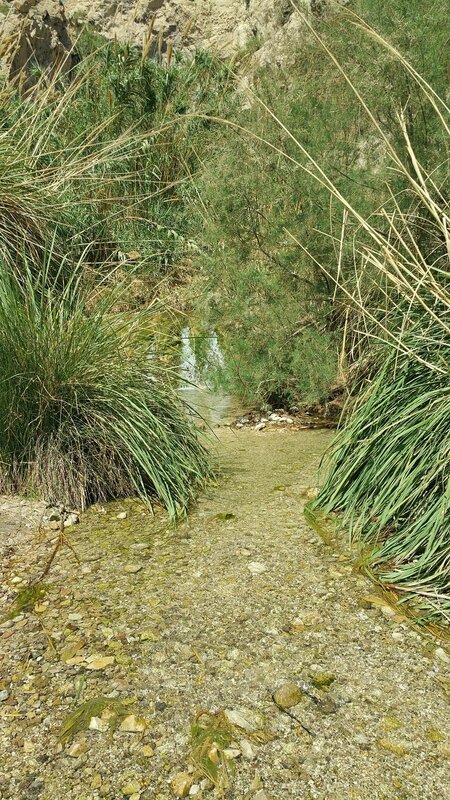 We then walked down to the Elah brook to pick smooth stones as a memento. To learn more, go to https://azekah.org/ and http://www.biblewalks.com/Sites/ElahValley.html. From Elah we moved on to Tel Beth Guvrin, the only Roman gladiator amphitheater in Israel that is open to the public. There is additional evidence of a Crusader fortress and a Byzantine church called St. Anne's Church. 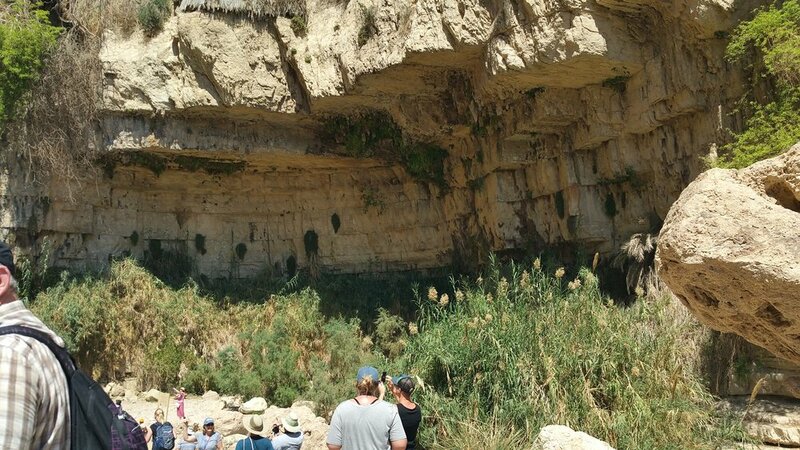 We stopped for box lunches in nearby Maresha, a Roman-era city famous for chalk caves carved by ancient inhabitants. Maresha was later abandoned and moved to Beth Guvrin. To learn more, go to http://www.parks.org.il/sites/English/ParksAndReserves/BeitGuvrin/Pages/default.aspx. Next we moved on to Lachisch, the most important city in Judah after Jerusalem in the 9th century BC. Through the compromises with pagan idols by king Amaziah, the Assyrian army utterly destroyed the city and the king (2 Kings 14:1-22). In the excavations have been found an Israeli tower and well-preserved gates. But a discovery as recent as the Fall 2016 is astounding: an unused toilet seat. In the reforms of rampant idolatry by the people of Israel, the toilet seat was put on the high places as a statement to those who were not serving the Lord of Israel alone: "your god is nothing but..." To read of the reforms, see 2 Kings 18-19 and the rise of king Hezekiah. The Lachisch site reminds us that what matters more than anything else is faith in the one true God. The mistakes of ancient Israelis can be avoided by understanding and acting on Jesus' own words recorded in John 3:15-16. Later the apostle John would write about the importance of guarding ourselves from idols (1 John 5), but we all have this same danger when we trust ourselves or other things rather than exercising faith in God. It is interesting that this battle in Lachisch is commemorated on a wall in Nineveh in the king's waiting room. To learn more, go to http://www.bible-archaeology.info/bible_city_lachish.htm. Next we made the journey further south to the city of Beersheba. "From Dan to Beersheba" became a common way in the Old Testament to describe the land of the people of Israel, from north to south. Beersheba is in the Negev in the southern and widest portion of Israel, located between the Mediterranean Sea and the Dead Sea. It's very arid and desert-like. So why would anyone move here? It feels like the middle of nowhere. But to the patriarchs, it was an important place. The whole history of the nation of Israel begins with the patriarchs: Abraham, his son Isaac, and his grandson Jacob. And Beersheba is part of each of their stories. One of the highlights here was to walk through a water cistern that shows both how important water is to a civilization as well as how much water could be stored. To learn more, go to http://www.jewishvirtuallibrary.org/beersheva. From Beersheba we traveled on to Tel Arad, located on a high mound in the wilderness, another place where the people of Israel drifted from God's commands. Here they reasoned, "We are too far from the temple, so we will just make our own." One of the sad discoveries at Arad is the presence of two temples and idol stones which indicate that the Israelites used temples erected to two deities. Despite Moses forbidding them (Deuteronomy 12), high places of worship flourished throughout the land according to the Bible. Read Numbers 21 for some more perspective on this problem in Israel. To learn more, go to http://www.bibleplaces.com/arad/. After a long, hot day we made our final trek across the desert and down to the Dead Sea, what is purported to be the lowest place on earth. As one of my tripmates pointed out, though, the lowest place on earth is actually in Antarctica. God keeps His covenants. Here in Beersheba I had an opportunity to share with the group some observations from God's Word. The ancient idols and gods were fickle and hard to please. But the God of Israel was unlike those false gods. The God of Israel kept His word. Every time. He could be counted upon. The language for God keeping His word is ‘covenant’. So we traced the highlights of God's covenant with Abraham and how this man was willing to take God at His word and believe against impossible odds. But Genesis 22 and the ultimate test of Abraham was just the prelude, because 1800 years later God would come to offer Himself as that perfect substitute. God made a covenant with Abraham, restated it on Mount Moriah, and proved it in Jerusalem when He was lifted up on a cross. This is a new covenant with God based on what He did for us. God had in mind an unconditional covenant that would be offered on the mount when Jesus gave His life. In effect, He is saying to us: even when you can't keep your end of the deal, I am faithful and guarantee that my offer of forgiveness through Christ is always yours by faith. What an amazing, merciful and gracious God we can come to know through faith in Jesus. We continued our discovery of Jerusalem today by visiting the City of David. You may be thinking, "Wait. I thought Jerusalem is the City of David." Well, yes and no. Jerusalem is certainly the city of David in a broad sense, but technically the oldest part of Jerusalem is known as "the City of David." If you think about it, Jerusalem as we know it didn't exist when David arrived. So within Jerusalem is a more ancient area outside the current city gates which is named for its famous king and psalmist. To learn more, go to http://www.cityofdavid.org.il/en. We enjoyed a delightful tour with a guide named Oren who skilfully integrated history, humor and humanity throughout our adventure. The highlight of the tour was to travel through king Hezekiah's tunnel (2 Chronicles 32), an amazing engineering feat--carved out of rock--to bring water directly into the city during the reign of king Hezekiah in preparation for the assault by the Assyrians (8th century BC). Imagine walking through a 1750 foot narrow and frequently low-ceiling tunnel in the dark and in knee-high cool water. What a blast! 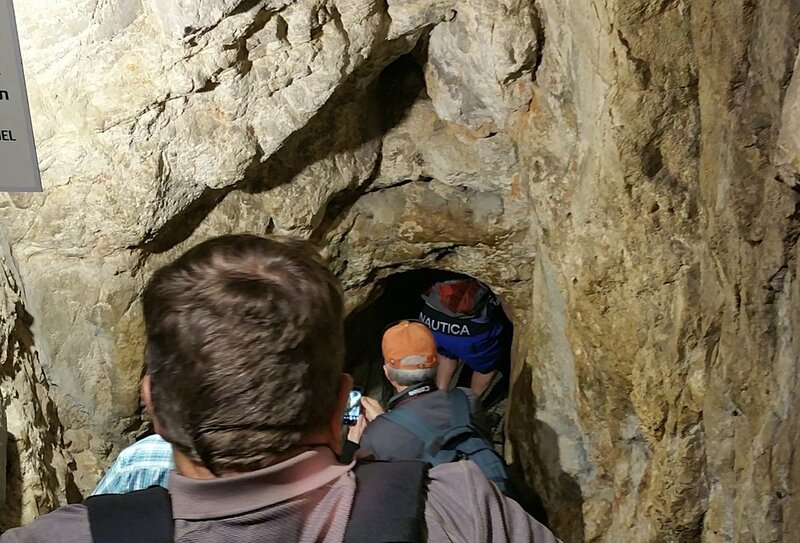 For the men who labored to carve this tunnel using oil lamps and chisels, not so much. To learn more, go to http://m.cityofdavid.org.il/en/virtual_tour/hezekiah’s-tunnel-city-david. We emerged from the tunnel to a downpour and rain that continued on and off for the remainder of the day. We stopped briefly to visit and discuss the Pool of Siloam as well. Entering through the Jaffa Gate we sat together for lunch and then walked along the ancient Cardo with modern shops. No shopping today, though. Next was a tour through a museum called the Wohl Museum of Archeology featuring what is known as the Herodian Quarter. This was an excavation of some of Jerusalem's wealthy leaders and priests from the time of Herod's temple over 2000 years ago. We gazed on some beautiful mosaics, colorful frescoes, and luxurious architecture. To learn more, go to http://www.israelandyou.com/herodian-quarter/. As we then looked at the Dome of the Rock in the distance, we discussed a huge Mennorah which stands outside the museum. The Mennorah is the ancient candlestick with seven candles. Sometimes though you will see candelabra with nine candles. Which is right? Both but for different reasons. The Mennorah does indeed have seven candles, but the nine-candle stand is a version of the Mennorah used in the celebration of Hanukkah. To learn more, go to http://www.jewishvirtuallibrary.org/the-menorah. After passing through an x-ray security checkpoint we emerged on to the Prayer Plaza and the West Wall commonly referred to as the "wailing wall." The wall is monstrous, composed of 11 large stone layers, 16 small layers, and a single cap layer. Women and men are separated, men required to wear a head covering, and all to be respectful. We each took the opportunity to approach God in prayer at the wall, touching this part of the temple wall that was part of Jesus' experience. We also were able to spend some time reflecting on God's Word at the southern steps to the temple where Jesus and His followers would have frequently entered the courts (read Psalm 122, one of the songs of ascent the Jews would sing as they approached the temple). These stones are indeed from the first century and are yet another place where Jesus walked. Immediately adjacent are many large ritual baths known as Mikveh. When you read of 3,000 people responding to Simon Peter's message at the feast of Pentecost (Acts 2:1-41), you have to wonder if they simply commandeered those Mikveh to get the job done. After visiting Robinson's Arch and walking through the Davidson Center we passed through another security check and re-entered the Prayer Plaza en route to the temple wall tunnels. These tunnels were formed when the conquering Muslims erected arches upon which the Moslem Quarter was built. The subterranean park explores the oldest foundations of the city of Jerusalem dating back to the second temple period (2000 years ago). Our guide was Josi (sp?) from Manchester, England. He did a nice job showing us the underside of Jerusalem complete with a huge 570 ton single stone in the temple wall. Massive! How did they get it there?!! By the time we were done with the tunnels, we were done. Tired. Ready to get to dinner. Hezekiah said, "Be strong and courageous. Do not be afraid or discouraged because of the king of Assyria and the vast army with him, for there is a greater power with us than with him. With him is only the arm of flesh, but with us is the LORD our God to help us and to fight our battles." And the people gained confidence from what Hezekiah the king of Judah said... And the LORD sent an angel, who annihilated all the fighting men and the leaders and officers in the camp of the Assyrian king. So he withdrew to his own land in disgrace. To be honest, you and I live at a time when we have great control over our own lives. We choose to go here, do that, whatever we desire within our means. We often don't think about it, but the consumerism of our culture has conditioned us to be self-centered and self-sufficient. And when things are going well enough, we act as though we are in control of our world. Then when crisis hits we are suddenly demanding that God rescue us or we simply blame Him for our misfortune. But what would it look like if we were to take to heart the attitude of Hezekiah? Can you imagine how you might respond differently to the crisis you are facing? How could you call out to God, not just to be rescued, but in honest and confident faith that He can be trusted? Things may still be difficult, but when we are trusting God with the impossible odds we face, that's when He loves to show us the way forward.